Unlike sedimentation and volcanism, active metamorphism is not directly observable. Metamorphic petrologists therefore must infer what constitutes the process of metamorphism by examining the products of metamorphic events. The purpose of this volume is to review the use of a powerful probe into metamorphic process: mineral assemblages and the composition of minerals. Put very simply, this volume attempts to answer the question: "What can we learn about metamorphism through the study of minerals in metamorphic rocks?" It is not an encyclopedic summary of metamorphic mineral assemblages; instead it attempts to present basic research strategies and examples of their application. Moreover, in order to limit and unify the subject matter, it concentrates on the chemical aspects of metamorphism and regrettably ignores other important kinds of studies of metamorphic rocks and minerals conducted by structural geologists, structural petrologists, and geophysicists. An overview of the chemical aspects of modern metamorphic petrology is timely because it brings together three areas of research which have reached maturity only in the last 25 years: (1) chemical analysis of minerals by microanalytical techniques; (2) application of reversible and irreversible thermodynamics to petrology; and (3) laboratory phase equilibrium experiments involving metamorphic minerals. Chemical thermodynamics is the formal mathematical framework which links measurable variables (i.e., mineral composition) to metamorphic variables which cannot be directly measured (i.e., chemical potential, pressure, temperature, fluid composition). Results of phase equilibrium studies involving metamorphic minerals at metamorphic pressures and temperatures (together with calorimetric and heat capacity data) permit these links to be quantitative. It is the union of analysis, theory, and laboratory experiment which allows the modern metamorphic petrologist to make sophisticated inferences about conditions of metamorphism and the factors which control these conditions. This union is the principal subject of the volume. The volume is organized much in the same way that one might approach a research project involving metamorphic rocks. Initially those chemical components which characterize the composition of minerals in the assemblages under consideration must be identified. In addition, the reaction relationships among components must be systematically characterized. The reaction relationships rationalize the prograde changes in mineralogy which rocks experience during metamorphism and, furthermore, form the basis for extracting information about intensive variables during metamorphism. Chapters 1-3 summarize strategies for identifying components in metamorphic minerals and for formulating chemical reactions among them. Chapter 4 develops, from classical thermodynamics, those equations which can be used to explicitly relate mineral composition to other variables of interest such as metamorphic pressure, temperature, and chemical potentials of volatile species in any metamorphic fluid phase. Chapter 5 is specifically devoted to geologic thermometry and barometry, and Chapter 6 reviews strategies for the determination of metamorphic fluid composition. Petrologists should not be content with simply calculating and cataloguing values of metamorphic pressure, temperature, and fluid composition. In order to characterize the process of metamorphism, we must try to understand what controls these measured values and the manner in which they evolve during metamorphism both as rocks are heated and buried and as rocks are cooled and uplifted. Chapter 7 explores how two concepts buffering and infiltration -- can act as general controls on fluid composition, mineral composition, and temperature during metamorphic events. In addition, this chapter develops procedures which can be used to evaluate the relative importance of buffering versus infiltration in the evolution of specific rocks. Chapter 8 demonstrates how integrated petrologic and stable isotope studies may be used, in principle, to reconstruct the prograde pressure-temperature-infiltration history of metamorphic rocks. Chapter 9 discusses the use of mineral inclusions and compositional zoning in minerals in evaluating both prograde and post-peak P-T paths of certain mineral assemblages. In addition, compositional zoning is considered as an indicator of cooling rates during post-peak uplift. Thus between Chapter I and Chapter 9 we go from the first step of describing a metamorphic mineral assemblage through a reconstruction of the physical state in which it crystallized to an analysis of what factors controlled that state and how it evolved with time. 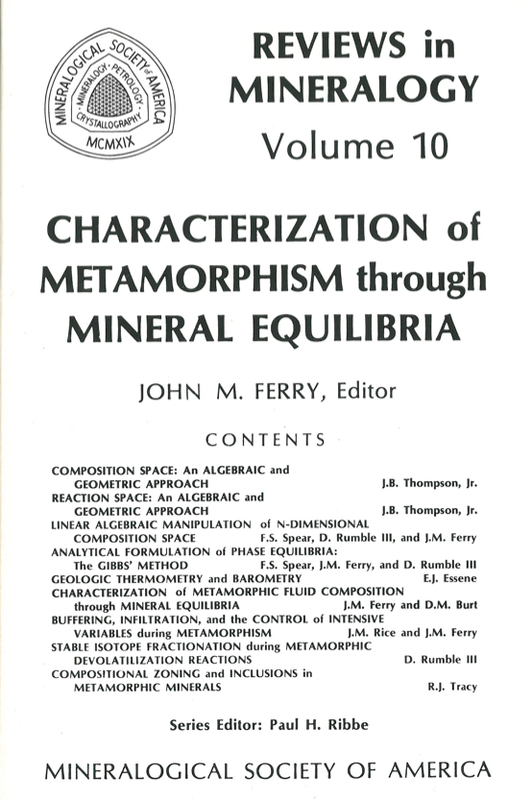 The contents of the volume reflect two themes which underlie modern research in metamorphic petrology. The first of these is an ever-increasing emphasis on the quantitative characterization of metamorphism. Current research less involves description and classification than calculation of intensive and extensive variables attained during metatamorphism. This volume hopefully serves as a text in the quantitative study of the chemical aspects of metamorphism. As a corollary to the emphasis placed on quantitative methods, we can see increasing attention paid to analytical as opposed to graphical treatments of mineral equilibria. Graphical representations, while undeniably valuable, can consider two (or at most three) independent variables. Analytical treatment of mineral equilibria is attractive because it rigorously keeps track of all variables pertinent to an equilibrium assemblage. The second theme is an increasing interest in the dynamics of metamorphism. Metamorphism obviously is not a static process -- it involves changes in pressure, temperature, mineral and fluid composition, etc. The classical static approach to quantitative metamorphic petrology, though, searches for the physical conditions of a unique pressure-temperature state which a rock or mineral assemblage records. Mineral equilibria are used to estimate single values of pressure, temperature, and fluid composition -- a sort of snapshot of what conditions were like. If mineral assemblages indeed represent a fossilized metamorphic state, then calculated P, T, Xi' however, simply represent a single point along the P-T-Xi-time path which a rock followed during metamorphism. Chapters 2, 7, 8, and 9 reflect an increasing interest among petrologists in the entire P-T-Xi-time path (or at least in more than one point along it). We can expect to see less satisfaction in the future with the snapshot model of metamorphism and more effort devoted to characterizing metamorphism as a dynamic process. Thus the volume not only summarizes time-honored current practices in quantitative metamorphic petrology, but hopefully also identifies some paths which may be followed in the future.